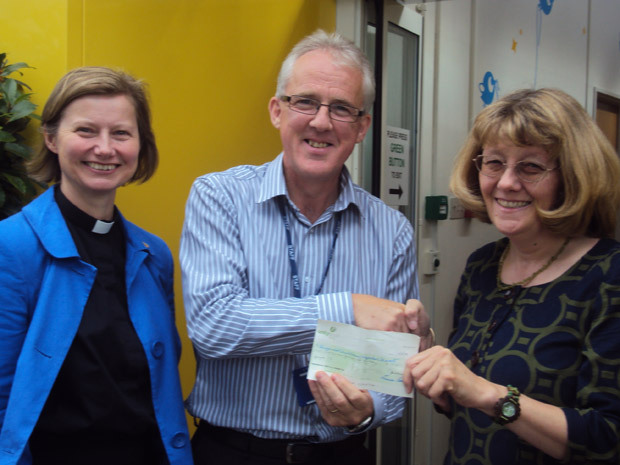 Members of the Crosspool Festival Committee have handed over a cheque for £1413.50 to Ryegate Children’s Centre. The money was raised during this year’s festival and will be used to transform the parents’ room at the centre from a drab and unattractive space into somewhere that is warm, bright and child-friendly. Frances Eccleston, Priest in Charge at St. Columba’s, and Eileen Kehoe presented the cheque to Dave Threlfall, Head of Therapies at Ryegate last week. A big thankyou to everyone in Crosspool who supported the festival and helped fundraise this impressive sum. This entry was posted in charity, crosspool, crosspool festival 2012, news and tagged crosspool festival, dave threlfall, eileen kehoe, frances eccleston, ryegate children's centre. Bookmark the permalink.